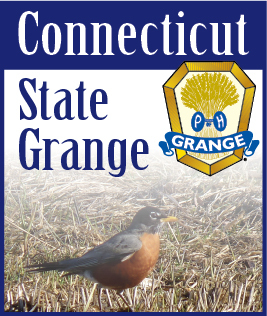 OCTOBER 2007 -- I cannot over stress the importance of each Community Grange being represented at the Annual State Session. This is the culmination of a years worth of Grange work and each Community Grange should have a say in what transpires at this Session. It’s just like voting. If you do not vote you cannot complain about who represents you. If you read last months edition you will know that there are some important resolutions to be acted upon. The least is one concerning an increase in dues to the National Grange. There are others that affect your communities. The State Grange is offering a $20.00 per night reimbursement to all delegates and members who stay at the Sessions Hotel this year in hopes of increasing participation. This is your Grange civic duty. The State CWA Committee along with the State Lecturer and the Junior director organized a “Let’s Celebrate” day in order to judge their contests and to raise funds. This is the first time this has been done and it was a learning experience. Judging by the amount of participation and the number of attendance it seemed a success for a first try. I thank all who supported this event and there are more details about it in other edition sections of this edition. I am sure that with a little tweaking, next years celebration will be super. As we enter the fall season the fairs are over. I enjoyed several of them and the one I enjoy the most is the Big E. At this time I must thank all of you Granger’s who greeted visitors to the Connecticut Room in the New England Grange Building or worked in the store on the main floor or marched in the parade on Grange Sunday. I’m sure you enjoyed yourselves at the fair. A special thanks to Doris Shaw and Betty Jane Gardiner for rounding up all you volunteers and for making it easier for me. The New England Grange Building is one of the biggest stages where the public meets the Grange. What we do there makes a lasting impression on the people and it’s a great opportunity for us to educate them. We do a great job each year and it’s all because of you, who put in the time for the good of our Order. Again let me remind each Community Grange to do their best to have a seat at the Annual Session. Where we will all work together for the good of our Order.